7 December 1942, nicknamed, "The Pearl Harbor Avenger"
24 total, 10 in tubes and 14 in reload racks. Primary torpedoes used were the Mark 14 and Mark 23, both steam driven. By the end of the war Bowfin was using the Mark 18 electric torpedo and Mark 27 acoustic torpedo nicknamed the cutie. Originally, one 4 inch 50-caliber and two 20 mms. Upgraded to, one 5 inch 25 caliber, one 40 mm and one 20 mm. Four General Electric 1,100 kw; 2,650 amps/415 volts propulsion; 3,600 amps/296 volts battery charging. Two 126-cell Exide type. Each cell was about 4.5 feet high, 1.25 feet deep, and 1.75 feet wide, and weighed about 1,650 pounds. One balanced streamlined type, limits 38 degrees to port and starboard. 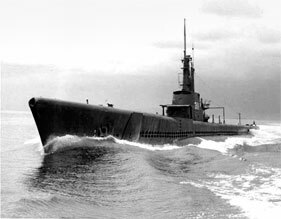 Of all the classes of submarines during World War II, the Balao-class contributed the most submarines to the submerged fight. Approximately 265 were ordered and more than 119 were completed between 1942 and 1945. The major improvements over the previous Gato-class was the upgraded thicker, higher yield strength steel and the pressure hull skin and frame. It increased their test depth to 400 feet. One Balao submarine, USS Tang (SS-306), actually achieved a depth of 612 feet, as stated by the Tang’s commander Richard O’Kane in his book, Clear the Bridge! : The War Patrols of the U.S.S. Tang. The Balao-class submarines entered service in mid-1943. They were in the forefront of the submarine force’s success of near-destruction of the Japanese merchant fleet and significant reduction of the Imperial Japanese Navy. 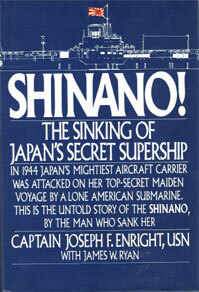 One of the most significant submarines of this class was USS Archerfish (SS-311) that sank the largest warship by a submarine, the aircraft carrier Shinano (59,000 tons).